On Thursday I am giving a talk at the University of North Carolina at Greensboro on social and sustainable investing. The event is a conversation on the theme of “What is Sustainable and Socially Responsible Investing and Why Is It Important?” The event will take place Thursday, Sept. 28 at 3:30 p.m. in the UNCG Faculty Center. This conversation is hosted by the UNCG departments of Environmental & Sustainability Studies and Geography. I will be joined by my colleague Luis Hestres (University of Texas at San Antonio). We will be talking about research we published in the Oxford Research Encyclopedia of Climate Science . Our paper is available open access (for a limited time) here. For more information on the event and the yearlong speaker series it kicks-off, visit here. On Thursday, September 28 I will be giving a talk at the University of North Carolina at Greensboro, joined by my colleague Luis Hestres (University of Texas at San Antonio), on sustainable and socially responsible investing. On August 10, 2017, I will be presenting on “Internet-Mediated Climate Advocacy: History, Convergence, and Future Outlook,” at the Association for Education in Journalism and Mass Communication (AEJMC) conference in Chicago. The research is authored with Luis Hestres (University of Texas at San Antonio). The past two decades have transformed the ways political groups and individuals engage in collective action. Meanwhile, the climate change advocacy landscape, previously dominated by well-established environmental organizations, now accommodates new ones focused exclusively on this issue. This article examines the convergence of these trends through the examples of 350.org, the Climate Reality Project, and The Guardian’s “Keep It in The Ground” campaign. Implications for the future of Internet-mediated climate advocacy are discussed. 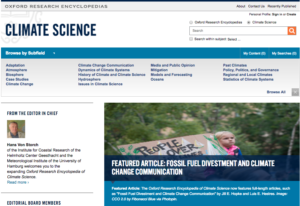 “Fossil Fuel Divestment and Climate Change Communication,” ORE Climate Science featured article July 2017. Since 2012, the fossil fuel divestment movement has expanded beyond college campuses in the United States and United Kingdom to include 688 institutions, in 76 countries, and 58,399 individual investors, with commitments totally more than $5 trillion dollars. In an article published in June by the Oxford Research Encyclopedia of Climate Science, along with Luis Hestres of the University of Texas at San Antonio, I examine the origins, growth and arguments for and against divestment from the fossil fuel industry.